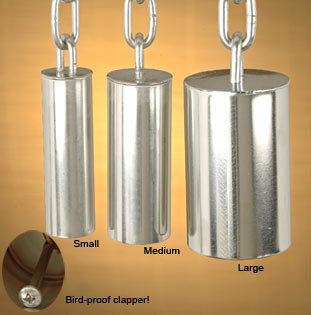 Stainless steel bell on short SS chain -- Small is 1" in diameter, 3-1/2" long. This size appropriate for your small size bird. A small bird should NOT get a large size bell! My TAG absolutely loves this bell. He has had a few others over the years, but for some reason he plays with this one far more than the others. It has a great tone, which is terrific. It's great to hear him swinging on it and whistling! My 2 birds have a small bell they have owned for several years, but only one of the 2 birds shows any interest in that bell. The other day I heard the new bell ringing vivaciously. I was pleasantly surprised to see the bird who never rings the older bell having a ball ringing this new bell. He plays with it often now. This bell has a really pleasant tone. The only downfall is that because the bell is heavy, it needs a strong chain. For the sake of my soft-billed birds, I wish it had a rubber or plastic chain instead of the heavy steel chain it comes with. However, I just love seeing both of my birds enjoying this steel bell. Q: Would this bell be appropriate (in terms of size and weight) for a budgie? Thank you! 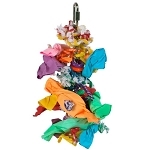 A: I would probably not give this to a budgie -- possibly could get head stuck in bell.